Charmaine White Face’s book shows how we are trapped by a system that does not recognise the rights or values of indigenous people and that the “entitlement” to human rights is limited by the system. Beginning in 1984, The Sioux Nation Treaty Council and other indigenous bodies from around the world were involved in developing the “Declaration on the Rights of Indigenous Peoples”. In 1994 a United Nations Declaration was drafted and approved by two UN committees. 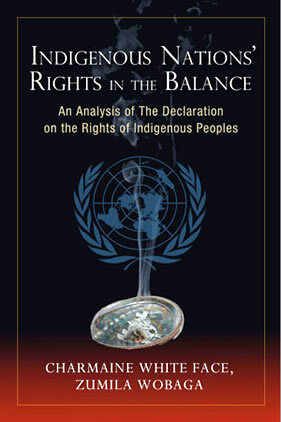 But in 2004 chairperson-rapporteur Louis Enrique Chavez presented his own version of the text to the UN Intercessional Working Group on the Draft Declaration on the Rights of Indigenous Peoples. This text was ultimately sent to the UN Human Rights Commission for passage. It did not have approval of the Indigenous People or the states who took part in the Original Declaration of 1984. This led to a five-day hunger strike/prayer fast, by six of the indigenous representatives, the author included, to reinstate the original text. An agreement was not reached. In 2007, the UN General Assembly completed its passage of the Declaration, which was finally approved. Comparative analysis of the three versions show how the Original Declaration is altered in favour of member states, leaving indigenous people without basic human rights or indigenous integrity. The author tells us how “the wording in the UN’s amended and approved Declaration will benefit the colonisers more than the Nations it was designed for”. It is plain to see when reading the comparative analysis in this book that changing a sentence, deleting or changing a single word from the original declaration was carried out with the intent to disempower an article or severely weaken it. This also has the affect of changing the bias of an article from being a right to be upheld for indigenous nations, to a lesser commitment. Throughout, the changes are aimed at removing the language of rights, substituting instead the language of responsibilities or intentions, which governments can choose to implement or not. In short, the aims of the original declaration have been brutally compromised. Paragraphs and articles are shown separately in their three different versions, with passages underlined to show the changes. After each set of three a detailed comparative analysis is made by the author. This makes for disturbing reading as you see the original declaration change from positive to negative. It is made clear that the United Nations Declaration on the Rights of Indigenous Peoples, as the published version is entitled, will not attribute sovereignty to indigenous nations. The UN speaks of indigenous “populations”, “people”, “peoples” etc and clearly avoids the use of the term “indigenous nations”. Many indigenous peoples view themselves as separate nations (the Great Sioux nation for example) but this status has never been recognised by states, who insist they are simply minorities within greater nation states. The book also carries a brief history of the Great Sioux nation and its association with the United States over the past 150 years. Treaties and agreements made with the US over this long period have always been cheated on. The 1868 Fort Laramie Treaty, a legally-binding agreement granting land rights to the nation, has been repeatedly violated. Since that time, vast areas of land granted in the treaty have been taken and abused, and tribal land continues to be drastically reduced.